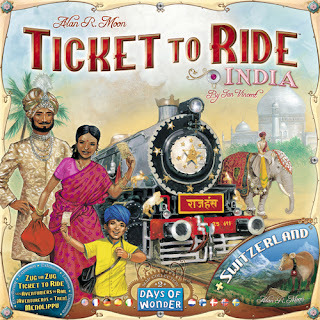 Days of Wonder has released another in the Ticket To Ride Map Collection. This latest release, Ticket To Ride India contains a map of India and a map of Switzerland. As with Ticket To Ride Asia, this is an expansion and requires either Ticket To Ride USA or Ticket To Ride Europe. Embark on a tour of India and create a Grand Tour for extra bonus points. Or, discover Switzerland's challenging geography as well as neighboring countries that include Austria, France, Italy, and Germany. So jump on board and choose your trip. Stop in at Off the Charts Games for this expansion to Ticket To Ride and for other fabulous games. We are located at 30 NW 2nd St in Historic Downtown Gresham.